Nutritionally balanced with active people in mind. 10 grams all natural protein from oats, chia seeds and nuts (no powders! 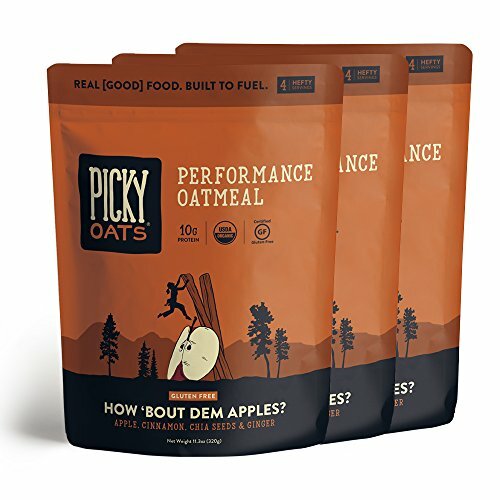 ), and much lower added sugar than conventional instant oatmeals. How 'Bout Dem Apples features over 50% ingredients that are toppings including vitamin-c rich apples, ginger, and almonds. USDA Organic, Non-GMO, Vegan, Gluten-Free, Dairy-Free, Soy-Free, Nothing Artificial. Developed by chef Elyse Kopecky, co-author of New York Times Best-selling Cookbook Run Fast. Eat Slow. Easy to prepare, just empty into a cup or bowl and add hot water (or your favorite cold mixer for overnight oats). Final Price as low as $27.95 Shipped!